Stephen sez: Tomorrow (November 22) is a big day for me. After selling close to half a million eBooks over the past twelve months I’m now taking a step back from self-publishing. I’ve spent twelve months promoting, marketing, plugging, Facebooking and tweeting and I’m exhausted. It’s time for someone else to do the hard work so that I can do what I do best – write. So as of tomorrow Amazon Encore takes over the publishing of Once Bitten, one of my bestselling self-published eBooks. Next week they take over The Basement, which topped the UK Kindle charts for several months and sold more than 150,000 copies. Then early next year Amazon’s new imprint 47North is publishing my three Jack Nightingale supernatural detective series – Nightfall, Midnight and Nightmare. Self-publishing was always an experiment for me. In fact I was one of the first authors to self-publish on the Kindle, in the days before KDP when authors had to go via a company called Mobipocket. I hardly sold any and months would go by without a single sale. But everything changed for me in the summer of 2010 when Amazon opened its first Kindle store outside of the US and allowed us Brits to buy from Amazon.co.uk. The new store, plus the fact that the Kindle was about to become the most Christmas-gifted item of all time, gave me the impetus to start self-publishing. Exactly twelve months ago I put up three more eBooks on the Kindle through Amazon’s KDP platform, books that my UK publisher Hodder and Stoughton had turned down. There was a vampire story (Once Bitten), a serial killer novella (The Basement) and a science fiction murder mystery (Dreamer’s Cat). It’s been a resounding success. I don’t know of any UK-based author who has sold more self-published books. (Though fellow Brit Lee Child of course was one of the first to hit the one millions Kindle sales mark). Over the last twelve months I sold 155,662 copies of The Basement through the UK Kindle store. Mainly at the Amazon minimum (75p plus 11p tax in the UK) but over the last couple of months the price has gone up to £1.49 (about $2). Over the same period I sold 82,583 copies of Once Bitten and 19,810 copies of Dreamer’s Cat. The Kindle success spilled over onto the other eReaders and by the summer I was selling tens of thousands of copies a month on iBooks. 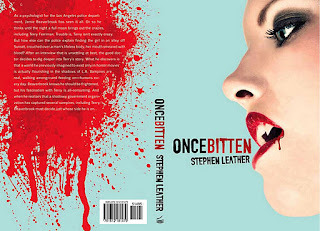 My sales in the US were much lower – just 5,197 copies of The Basement and 2,397 copies of Once Bitten over the year. I pretty much tried everything to boost my US sales. I blogged, I tweeted, I gave away free copies, I posted on the Kindle US forum (not a pleasant experience, it has to be said). Nothing worked. Even a guest blog on Joe’s site only shifted a few dozen extra copies. Eventually I gave up trying to sell cut-price books on the Kindle in the US and raised my prices to $3.99. Earnings from the US held steady throughout the year at about $1,200 a month – less than a tenth of my UK earnings. That’s why I’m so excited about the Amazon Encore deal. Yes, I’ll get a lower royalty rate (they don’t pay the 70 per cent royalty on Amazon Encore books, no matter what the price they sell at). And yes I lose control over the marketing and pricing. But I’m hoping that Amazon’s marketing expertise will kick in and hopefully replicate my UK success in the US. Their massive database knows which customers like vampire stories and which prefer serial killer stories. They’ll be able to offer my books to the right customers, hopefully at the right price. I’ve seen them do it several times in the UK, where the Amazon imprints have launched American writers into the UK Top 10. It’s as impressive as hell, they can do in hours what it takes me weeks to do. If they can do that for me in the US then the sky’s the limit. Say the US market for Kindle eBooks is five times that of the UK’s – if that’s the case then there’s no reason that Amazon Encore couldn’t sell a million copies of The Basement and Once Bitten. I’m keeping my fingers crossed. But one of the fascinating things for me about my whole Kindle experiment has been the support I’ve received from my UK publisher, Hodder and Stoughton. I’ve been with them for more than twenty years, ever since they paid a six-figure sum for my books The Chinaman and The Vets. It was that advance that launched my career as a full-time writer and changed my life forever. Not only were Hodder supportive of my eBook experiment, they also joined in and cut the price of one of my thrillers to 49p. The book, Hard Landing, is the first in my Spider Shepherd undercover cop series – and over the last 12 months Hodder have sold more than 120,000 copies. It spent weeks at the top of the Kindle UK chart and only recently dropped out of the Top 100. And not only that, there was an immediate boost in sales of all the other books in the series – and they were selling at £4.99 each. Over the year they sold more than 35,000 Spider Shepherd eBooks at that price. But the really big surprise for them came this summer when they released the latest book in the Spider Shepherd series – Fair Game. Sales of the paperback were twenty per cent up on the previous book at a time when the UK thriller market as a whole was well down. It’s become clear that my success with eBooks has fed through to my legacy publishing books in a big way. But it’s also clear that my publisher is keen to help me build on that success. So this year I have signed deals to write five more books for them in return for an advance of close to US$750,000. I know there are those who’d say that I’d make more money doing books myself. But I’m not so sure. Publishers publish. That’s what they’re good at. They find writers, they help shape their stories, and they sell them. All that’s changing is the method of selling stories, from paperbacks to eBooks. The big publishers are like oil tankers, it takes a lot of effort to make them change their direction and speed, but once they have moved they have one hell of a lot of momentum. Yes, I can arrange the editing myself, design covers, market, promote and publicise. But that’s hard work and it’s not what I’m good at. I’m a writer. I write. And I’d rather concentrate on writing and let my publisher get on with publishing. Yes, the industry is changing. Yes, sales of paperbacks are down and sales of eBooks are rising. Without a shadow of a doubt the eBook market will dominate in the future. But I think what we have seen over the past year has been a bubble, a bubble that is now slowly deflating. Not a bubble in sales – but a bubble in the performance of self-published eBooks. A year ago, when I started my eBook experiment, it was relatively easy to get three of my books into the Amazon Kindle UK bestseller list. And they stayed there – for months. Only last month did they leave the Top 50. But an eBook I released last month – optimistically titled The Bestseller – went into the Top 10 but didn’t stay there for long. And most of the eBooks that were doing so well earlier this year have pretty much disappeared from the bestseller lists. The self-published authors who were shouting that the traditional publishing industry was dead and that the future lay with them are now seeing their books dropping out of the Top 1000 and sales slowing to a trickle. In their place we’re seeing the old faces starting to dominate the bestseller list – Lee Child, Stephen King, Michael Connelly, PD James. The usual suspects. And among them are the Amazon-published authors benefiting from Amazon’s marketing muscle. Why is it happening? I don’t know. It might be that the marketplace is changing, it might be that Amazon has changed the way it compiles its bestseller lists. But the cause doesn’t matter – it’s the effect that counts. And I think that bit by bit we’ll see the legacy publishers tighten their grip on the eBook bestseller lists, and the self-published books will find it harder and harder to make any sort of impression. Don’t get me wrong, I know that I’m far from being the typical self-publisher. And what works for me probably wouldn’t work for a writer who has never had a traditional publishing deal or who is only just getting started. But I’m happy enough now to get off the self-publishing treadmill and let someone else do the hard work. I’ve got books I want to write! Joe sez: First off, I'm thrilled for Stephen's success. It's nice to see someone do well in the UK, because my sales there have been mediocre (I make about what Stephen makes in the US, about $1500 a month). So there IS a UK market, I just haven't been a huge success there. Yet. Yet is the operative word, because I've learned something about ebooks that doesn't mirror paper releases--bestsellers are no longer dependent on the release date. My novel The List has been in the Top 100 on three separate occasions. Sales of the rest of my backlist have fluctuated wildly as well. No ebook can remain in the Top 100 forever. A saturation point is eventually reached as the number of Kindle owners browsing the list buy a copy. But the people browsing the list this month may not be the same people browsing it next year. As more Kindles are sold, more readers can discover your ebook. Legacy publishers have said for years that readership is stagnant in the paper book world. This isn't how it works in the ebook world. A new release gets some attention, and this spurs sales, but an older book can also get attention via word of mouth, a push from Amazon, or some publicity or marketing effort. That release will be new to new Kindle owners, or to Kindle owners that missed it the first time, and sales can once again spike. While I find it interesting that Stephen's legacy publisher was willing to experiment with price, and then offer him a large contract, I don't react with optimism to this development. I've been begging my publishers for years to lower my prices, and they do whatever the hell they want. As a result, even though I have more legacy novels than self-pubbed novels, my self-pub outsell my legacy 5 to 1. You see, legacy publishers know they're stuck. On one hand, they've seen ample evidence that low prices lead to more sales and ultimately more profit. On the other hand, they are worried that if they flood the market with low priced ebooks, each title will make less money overall, which when coupled with dwindling paper sales will put them out of business. Tomorrow Stirred is launching. I'm pretty sure it will hit the Kindle Top 100, and I'm hoping (like Shaken) it will hit the Top 10. Combined, Blake and I have sold over 650,000 ebooks. Add Amazon's marketing muscle to our existing fanbase, and we have the potential to sell a whole bunch. So, in the ebook world, name recognition and an existing fanbase plus a marketing push can equal sales. I've seen this happen time and again. I've also seen that a marketing push, even without name recognition, can lead to sales. So can word of mouth coupled with a good book and a smart cover and a fair price. Amazon has made it very easy for readers to find things that interest them. If an author has several books out, that gives readers many chances to find them. The more virtual shelf space you have, the more ebooks you can sell. A new release, or a big marketing push, can also buoy the sales of your backlist titles. A rising tide lifts all boats. 1. Write a good book with a good cover and a good description, and price it reasonably. 2. Do this many times to increase your sales. The more ebooks you have, the more chances you have to find readers. 3. Name recognition can come from prior legacy sales, or name recognition can be spontaneously created as multiple titles begin appearing on bestseller lists and fueling each others' sales. 4. Ebooks are forever, and shelf space is unlimited, so the sales of titles can actually improve over time as more readers buy ereading devices. 5. Marketing pushes, price drops, media attention, and author efforts can increase sales. I have a theory that bestsellers exist in the legacy world because of distribution. James Patterson is everywhere, so he sells a lot. If you look at many bestselling authors, a lot of them are consistently disappointing fans, as evidenced by low star ratings and bad reviews. But because they are safe (as in familiar) and their brands are constantly being reinforced with new releases that get widespread distribution, they remain in the public eye and popular. Some of that popularity translates to ebook sales, even at high prices. But bestsellers are still selling many more paper books than ebooks. There have only been a few bestsellers who have cracked the Kindle million club, even though their paper sales are in the multiple millions. Contrast this to midlist writers, whose ebook sales are equal to or surpass their print sales. As print sales become smaller and smaller, we won't see as many of these familiar bestselling authors on the bestseller lists, especially if their prices remain high. Unless you get big advance money, like Stephen did, I don't recommend taking a legacy deal. The drop Stephen is seeing in his self-pubbed titles isn't unusual--paper books begin to drop in sales almost immediately after a release. But paper sales drop faster, and hardly ever begin selling again, whereas ebooks do. I wouldn't call this a bubble. I'd call this an ongoing balance between those who have bought your ebooks and those who haven't. Some of those who have bought you will become fans and continue to buy your backlist and new releases. Some who haven't simply haven't discovered you yet. Others who haven't just aren't interested. There must be an algebra equation in there somewhere. The reason self-pubbing is still the way to go, is it relies on less luck than legacy does. With a legacy deal, you have to be lucky enough to be published, and then lucky enough again that your publisher doesn't screw things up, and lucky once more that you get widespread distribution, and finally lucky yet again in order to sell to readers. If everything works as everyone hopes, you can sell a lot of books. But even if you do, you're getting the shaft on royalties, and have no control over cover, title, or price. When you self-publish, you only have to get lucky once, to sell to readers. But even though I don't agree with the bubble idea, let's say Stephen is correct. Does it matter? Ebooks are becoming a global market, and sales can fall and then rise again. So there are plenty of people who can still buy Stephen's backlist titles, and many will over the next few decades. Even if he (or I) get pushed completely off the bestseller lists, as more people buy ereaders, we can still make a very comfortable living having multiple titles ranked under 10,000. In the future, we could have all of our titles ranked above 100,000 and still be millionaires. But I believe it will be easier to do that at 70% royalties than 17.5% royalties. I also believe that partnering with Amazon, who can give a current title a big marketing push, is a smart way to remain on the bestseller lists and in the public eye. It's going to be fun to see what happens with Once Bitten and Stirred when they both launch tomorrow. It will also be fun to see what happens to our backlists. And by fun I mean lucrative.